The versatile designs of Michele diamond watches put the accent on style! Shape, color, and shine awaits you. What is your preference? Choose round, rectangular or gently curved. A face full of feathers design. A black, Mother-of-Pearl, metallic gold, blue or cocoa dial. Or one with Guilloche diamonds. Numbers or hour markers. Stainless steel, gold plating or a combination of the two. Check out the face full of feathers design of the Deco II Bijoux Blue. A multi-hued mosaic or pretty in pink diamond dial of Deco 16. The perfect polish of the Serein Soiree. The retro glamour of Urban Coquette. The sporty CSX Signature-36. And more! Customize your timepiece to suit your mood. You can do it quickly and easily with a full line of interchangeable straps. Wear a bracelet one day and an alligator band the next. An exotic skin the day after that, and leather that evening. 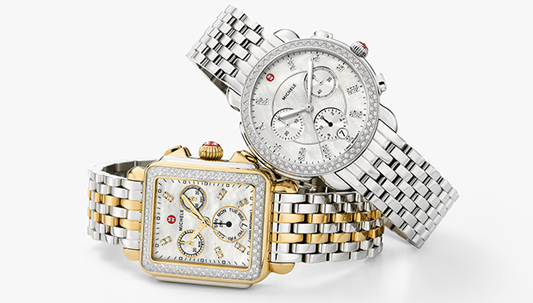 Michele diamond watches offer a diverse line of timepieces. They are modern classics. Pick up your piece of everyday luxury.